Decayed, damaged, cracked, chipped off, broken, stained and discolored teeth compromise and ruin esthetic profiles and impart an unsightly appearance to your smiles. External tooth surface discolorations and minimal decay of tooth surface enamel layer can be easily corrected and masked with the help of teeth whitening and simple filling procedures respectively. Coffee and tea stains can be removed with simple scaling and polishing procedures. However, deep internal stains, discolorations and extensive tooth decay specifically involving the front teeth often need more invasive restorations in the form of porcelain dental veneers and crowns for masking the disturbed appearance of teeth. These restorations require removal of healthy natural tooth tissue for achieving stability, retention and strength and are destructive of natural tooth structure. Albuquerque New Mexico 24 hours emergency specialist cosmetic & restorative dentist Dr William C Gardner at NM Family and Cosmetic Dentistry PC provides conservative alternative management option with an excellent overall outcome in the form of direct composite lamination and veneers designed to cover the visible surfaces of your front teeth. Q. WHAT ARE DIRECT COMPOSITE VENEERS? A. Direct composite resin veneers, chair side veneers or direct composite bonding are extremely wafer thin, tooth colored, translucent restorations fabricated with composite resins on chair side in the dental office. 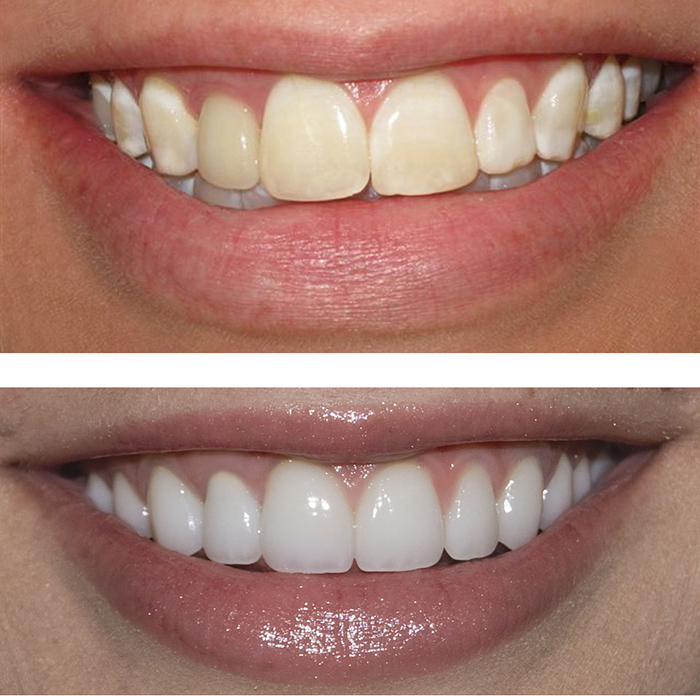 These veneers do not require second stage dental laboratory step like indirect porcelain or composite veneer prosthesis. Q. IS THERE ANY DIFFERENCE BETWEEN DENTAL LAMINATES AND VENEERS? A. Dental laminates are thin prosthesis usually placed on the surfaces of teeth without any preparation and maintain the underneath tooth color. These can be termed as no prep veneers. Traditional dental veneers, on the other hand, alter and mask underneath tooth discolorations such as tetracycline stains and color changes following root canal treatment. These need minimal removal of natural tooth enamel. Q. WHICH ABNORMAL CONDITIONS CAN BE TREATED WITH DIRECT COMPOSITE VENEERS? Q. WHAT ARE THE ADVANTAGES OF DIRECT COMPOSITE VENEERS? Q. HOW LONG WILL DIRECT COMPOSITE VENEERS LAST? A. Direct composite veneers do have the propensity to get darken or damaged with the passage of time but these offer durability up to the range of 7-10 years. These restorations can undergo repairs and achieve the original shine and shade with simple addition of composite resin material. Do you have cosmetic defects in your teeth? Is it making your smile less pleasant? Is this owing to decayed, missing, crowded, crooked, mal-aligned or mal-posed teeth? You can visit your 24 hours emergency Albuquerque New Mexico dentist Dr William C Gardner. Book an appointment at NM Family and Cosmetic Dentistry PC. He is available throughout day and night. He focuses upon best solution for improving your dental and oral health conditions. Thus, call right away for an appointment!